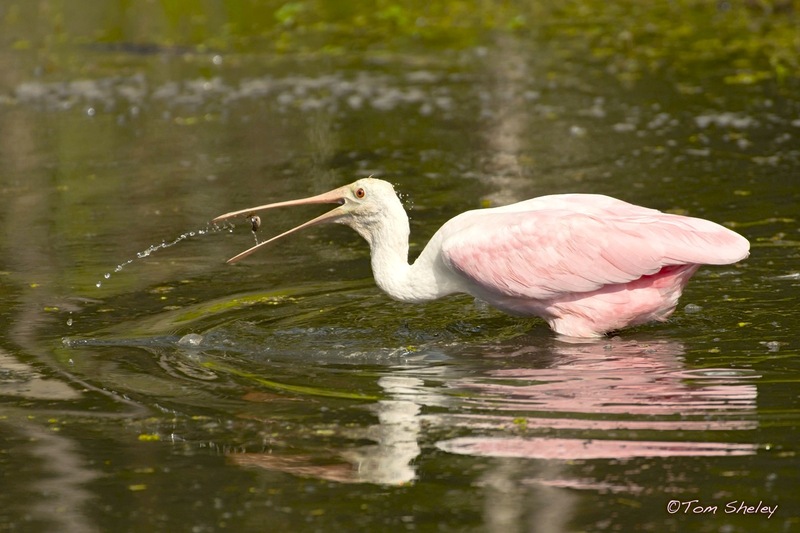 ROSEATE SPOONBILLS (Platalea ajaja) are rare visitors to the Northern Bahamas. For Abaco they are classified with the undignified term ‘vagrant’, meaning essentially (a) that you will be very lucky indeed to encounter one, so therefore (b) it is highly unlikely to be worth making a special trip based on the likelihood of seeing one. Try Florida instead. We saw one once when bonefishing far out on the Marls. It was unmistakeable, but well beyond the effective range of the puny ‘don’t-really-mind-if-it-takes-a-dive’ camera I had with me. 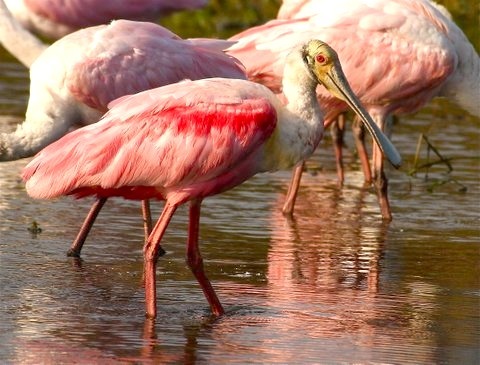 The spoonbills in this post were photographed elsewhere in the Bahamas or in two cases, Florida. The wonderful one below of a spoonbill ‘flipping’ a fish was taken there by Ohio bird expert and photographer Tom Sheley. 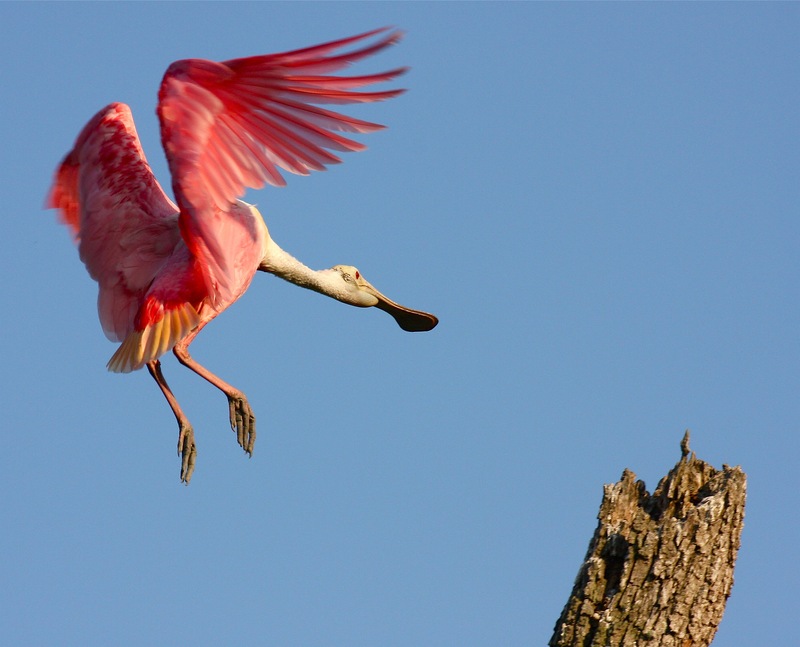 Unlike herons, spoonbills keep their necks outstretched in flight. They are most likely to be found in marshes, salt-water lagoons and on mudflats. They are gregarious and mix in happily with herons and egrets, though there is some competition for food. 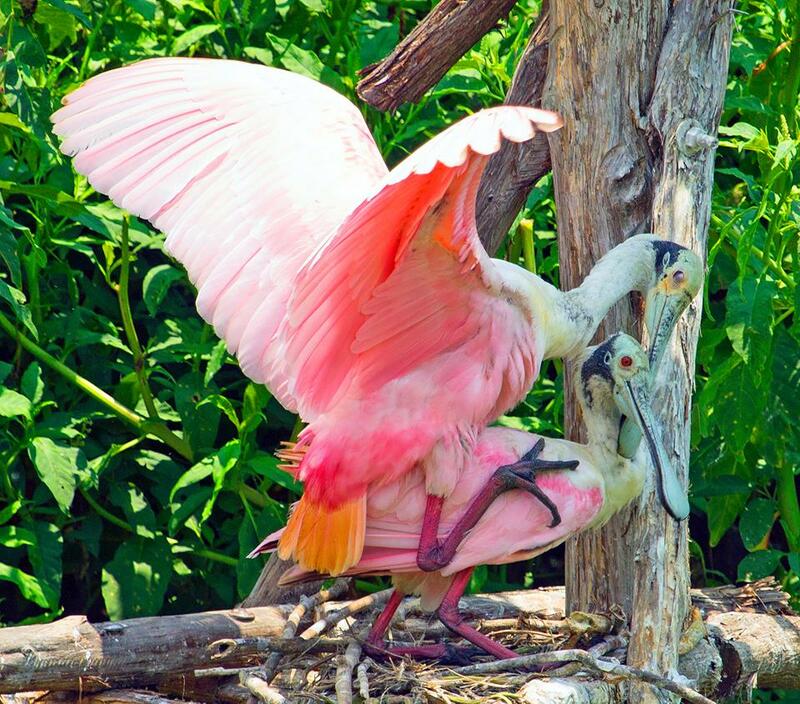 Spoonbills nest in shrubs or trees, often mangroves. 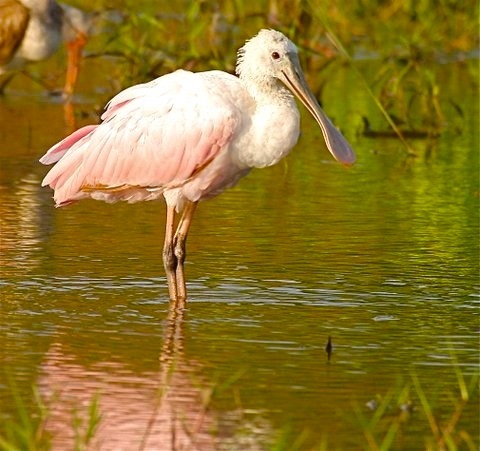 Spoonbills tend to get pinker as they get older. 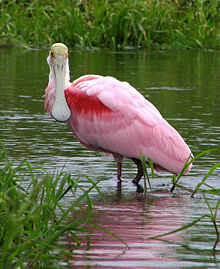 As with American Flamingos, the pink colouring derives from their diet, which contains carotenoid pigments. The colouring ranges from pale pink to loud pinks and reds, depending on age and location. 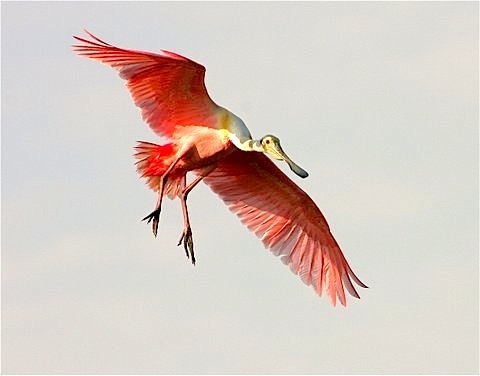 Spoonbills feed in shallow fresh or coastal waters by swinging their bill from side to side while steadily walking through the water, often in groups. The spoon-shaped bill allows it to sift easily through mud for the edible contents – crustaceans, aquatic insects, frogs, newts and small fish ignored by larger waders. This excellent 1 minute Audubon video shows exactly how they feed, with some white ibises for company. 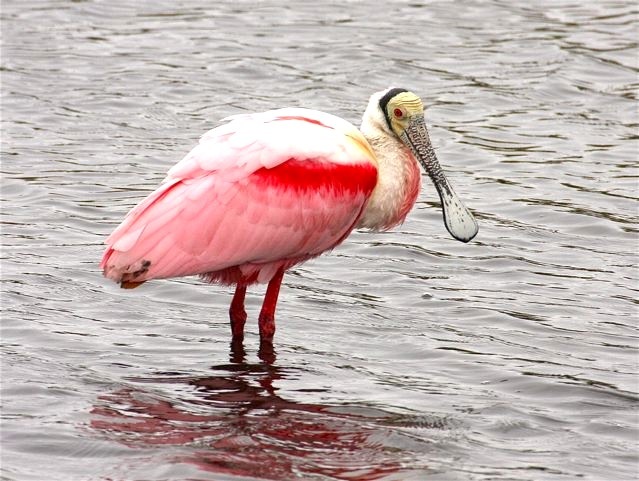 This entry was posted in Abaco, Abaco Birds, Abaco Wildlife, Bahamas (Abaco), Birding Abaco, Bonefishing Abaco and tagged Abaco Birding, Abaco Birds, Abaco Bonefishing, Bahamas Birds, Birds Abaco Marls, Bruce Hallett, Platalea ajaja, Roseate Spoonbill Abaco, Roseate Spoonbill Bahamas, Roseate Spoonbill Florida, Spoonbill Colour, Spoonbill diet, Spoonbill in Flight, Spoonbill Video, Tom Sheley, Woody Bracey. Bookmark the permalink. I always enjoy seeing my goofy pink friends the Spoonies! Beautiful birds! From March 15 to May 15 they roost at High Island, just north of Galveston, Texas. There may be 1000 of them on any day, mixed with a few white egrets. They have flown 600 miles across the gulf and High Island is the first sign they have of fresh water and a place to rest in their migration.